You can replenish your chosen jar (either a previously used candle jar, or suitable vessel that suits your home decor). ◾We will empty, clean and refill it with a natural mineral wax, and a fragrance of your choice. ◾Wright & Green also use innovative wooden wicks, which create a soft crackling sound when burning. These wicks are organic and eco friendly. To determine how many grams, fill you vessel with water and then pour into a measuring Jug. 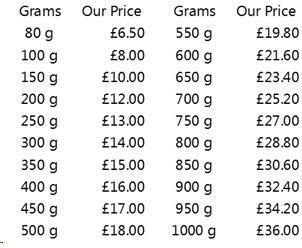 100 ml = 100g for our pricing purposes. SIGN UP TO OUR NEWSLETTER FOR THE LATEST NEWS AND OFFERS! © COPYRIGHT 2017 SHOPWIRED - ALL RIGHTS RESERVED. ECOMMERCE WEBSITE DESIGN BY SHOPWIRED. LTD.